Samsung is a South Korean multinational conglomerate. The company manufactures a wide array of technology products. Samsung opened its first European stores in 2014 to provide consumers with mobile device services. In 2014, Samsung launched its first UK outlets and quickly grew its presence across Europe and North America. It created two store formats: Samsung Support Centres and the Samsung Experience Store (with Support Centres within them). Samsung Support Centres provide expert help and advice, as well as device repair services – from same-day on-site smartphone screen repairs to more advanced adjustments that need to be shipped to dedicated repair centres. Samsung needed a platform that would manage those customers entering both the Support Centres and Experience Stores, in order to provide a seamless waiting experience and to support a highly detailed level of service. To offer a premium customer experience and service, Samsung deployed Qudini to its Support Centre stores in the UK, Belgium, Germany, Canada and the Netherlands. Customers entering the store are greeted by a host using the Qudini tablet app on a Samsung device. The host takes the customer’s name and smartphone number and adds them to a digital queue. Once added, the customer receives a SMS message to confirm that they’ve been added to the queue, their queue position, and estimated waiting time. As the customer’s turn draws near, they receive a further text message. The customer can also track their name on one of several Samsung large-format screens, displaying the queue of waiting customers. This process enables the customer to relax and engage with the store, whilst they wait to be served. The Qudini app allows the host to manage the waiting customers, alongside their colleagues’ activities, and to assign customers at the top of the digital queue to the next available advisor. 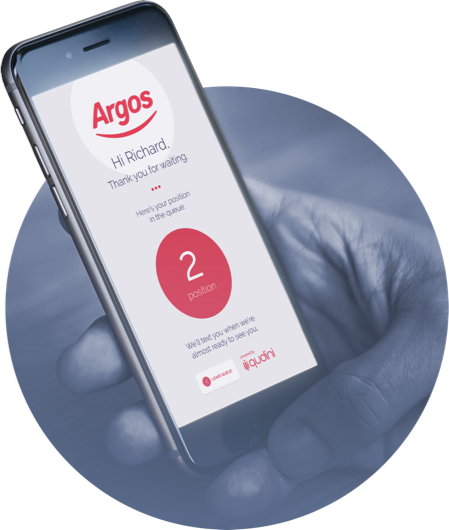 The seamless waiting experience ensures that a significant proportion of customers who join the queue will remain in store, even when there’s a lengthy wait. Stores using the Qudini software have extremely high NPS scores. Samsung Surrey Quays support centre was awarded the best in-store experience throughout Samsung. Qudini helps the staff to better manage customers and their time, ensuring a more seamless and efficient operation. The managed process allows customers to relax and browse the Samsung devices on display, whilst they wait for service. The Qudini software helps Samsung to handle extremely high traffic. Since using Qudini, the volume of customers added to the tool has more than doubled, yet the average waiting time has dropped by 50%. Qudini enables Samsung colleagues to give customers a premium brand experience, improving relationships and customer service.